NOREAS completed design of In Situ Chemical Oxidation (ISCO) of three shallow groundwater plumes at Former Naval Air Station (NAS), Alameda Point, California. The plumes were comprised of chloroethenes, while one of the plumes contained a mixture of chloroethenes and chlorobenzenes. The Record of Decision (ROD) for these plumes stipulated that ISCO would be the initial technology of choice, followed by polishing steps as necessary. ISCO had been previously used at the site and shown to only be effective at high contaminant concentrations. NOREAS proposed using ISCO with activated sodium persulfate as a viable alternate technology. Accordingly, NOREAS prepared a Remedial Design/ Remedial Action Work Plan which was subsequently implemented at the site. Subsequently, ISCO injections were completed, and four quarters of post-injection performance monitoring were performed. NOREAS prepare a Remedial Action Completion Report to document all the activities. 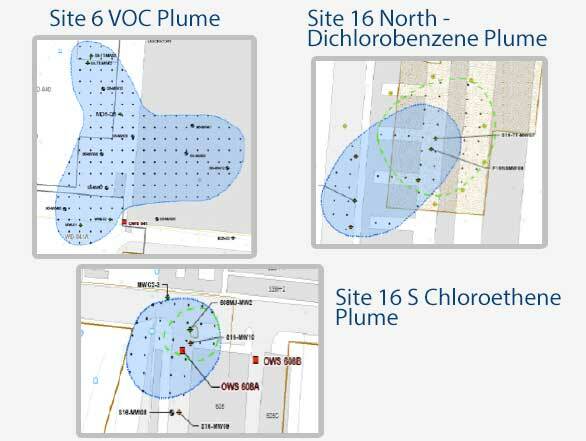 The data from the four sampling events indicated successful remediation in a substantial portion of all three plumes. Data from these events were used to design transition remedies as a polishing step and included enhanced in situ bioremediation and/or monitored natural attenuation. NOREAS had considered a sequential anaerobic/aerobic in situ bioremediation approach for treatment of residual dichlorobenzene isomers, which were not fully degradable under anaerobic conditions, and are recalcitrant under aerobic conditions.